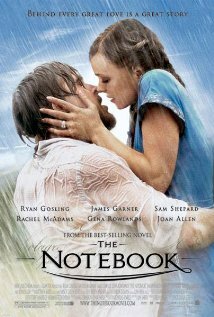 The Notebook, a movie directed by Nick Cassavetes based on the novel by Nicholas Sparks, unfolds as a typical romantic crowd-pleaser, but, despite its problems and shortcomings, offers attentive viewers a challenging meditation on love and fidelity. The film travels well-worn romantic pathways: boy meets girl, girls parents disapprove, the young lovers are parted, eventually rediscover each other, and are united. This typical romance narrative is portrayed by the attractive young actors Ryan Gosling and Rachel McAdams as the characters Noah and Allie. However, instead of portraying the young love as the primary narrative, the film places them inside another narrative: Duke, an elderly man in a nursing home, is reading this typical romantic story to an elderly lady who suffers from senile memory loss. The audience quickly notices that the story the old man is reading is the story of the two of them, when they were young. The question of the movie, then, is why the old man performs this daily ritual of reading the story, since the lady has no memory of the events, or of her life at all. Shortly after this recitation, what the nursing home doctor said was impossible occurs. The elderly Allie suddenly remembers everything. She remembers that she is Allie. That Duke is Noah. She asks what happened to her, why she cannot remember who they are. They have only a few minutes before the haze of senility overcomes her memory and she no longer recognizes her husband. She panics and is sedated. Duke cries as he watches her anguish, feeling a mixture of fear, loss, and guilt. The camera visits him, now alone in his room, as he looks at pictures of the two of them as a young couple. It is only here that we realize, since the images in the pictures do not resemble Gosling and McAdams, that the romantic story was not a flashback, not the omniscient and truthful eye of the filmmaker’s camera but an imaginative reconstruction of the tale. Without memory to guide her, the elderly Allie sees the story of her youth as something happening to strangers. Only then do we realize the shock of suddenly remembering what seemed, just moments earlier, like a fantasy. “It was us!” she exclaims. Then we see the full extent of Duke’s burden – the story of the notebook was written by Allie, years earlier as she realizes that she is losing her memory. It is inscribed with the instruction for him to read it to her, so she can “come back” to him again. Duke, an essentially healthy man, lives in the nursing home with one task – to spend each day attempting to re-awaken Allie. Some days it works, and then only for a few moments. His desire to see his beloved again is satisfied only with great effort and dedication, and then only temporarily fulfilled. But it was her wish to be revived, and so he can allow himself to see her die again every day: her look of tenderness replaced by paranoia and confusion as she succumbs to her condition. Duke is a modern Orpheus, going into the underworld to rescue his beloved, but losing her at the last moment. He is also Sisyphus, compelled to perform the same task each day, only to watch it fail. Like the sentiment expressed by Whitman, Duke wishes for his Allie to be resurrected, knowing instinctively that she cannot be lost forever. Perhaps the ritualized temporary resurrection Duke performs daily will be replaced with a resurrection that endures. When Jesus tells Martha that He is the resurrection and the life, he then proceeds to raise Lazarus from the dead. Lazarus dies again and waits to be resurrected. Allie, like Lazarus, comes back to life but only for a little while. For Whitman to say truly that “nothing is ever lost, or can be lost,” Allie must not merely be coaxed back to life, but to live again, without the possibility of disease or corruption. It is this hope – the hope for the resurrection – that the film encourages. Reblogged this on poeticora's Blog.